Join the discussion on our forums! 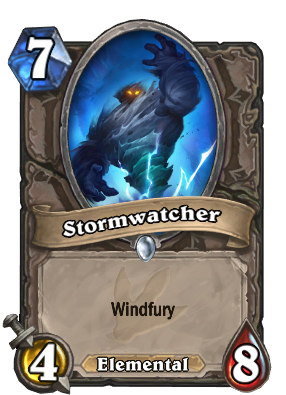 Come discuss Stormwatcher over in our dedicated Stormwatcher discussion topic. pretty nice in Corpsetaker Rogue actually, its nigh impossible for Priests to deal with as they've often used pint size + horror and silence before turn 7. 42.6% voted bad for this card.It is good in rogue even without corpsetaker.It has 4 attack . Priest cant deal with it without Pint-Size Potion combo or silence.You cant ignore it because bonemare or coldblood = lose. Why does this card sound so much different here then it does in-game? A likely explanation is that these are the base voiceovers and they have some sort of filter or two that this is passed through before or as it plays. I feel like this is to encourage people to go play the card in the game to hear the audio as it is meant to be heard rather than coming to a page online and clicking a button. Unfortunately these files are just extracted as they are from the game files and no additional effects are applied. I was going to say that but I was lazy. 1) The voice when you play it sounds so badass. "LIGHTNING STRIKES TWICE". 2) It can't be pained or deathed. 3) Throw it into a Handbuff Paladin deck and drop it on turn seven for a 7/11 windfury. SONIC BOOM! Definitely my third favorite card out of the expansion, next to Tarim and Lyra. So weird. I wish I knew the reason behind this (and other cards like Lyra the Sunshard). Can we talk about how amazing the golden for this is? Oh wait, I see OTK with priest buffs.